Hello. 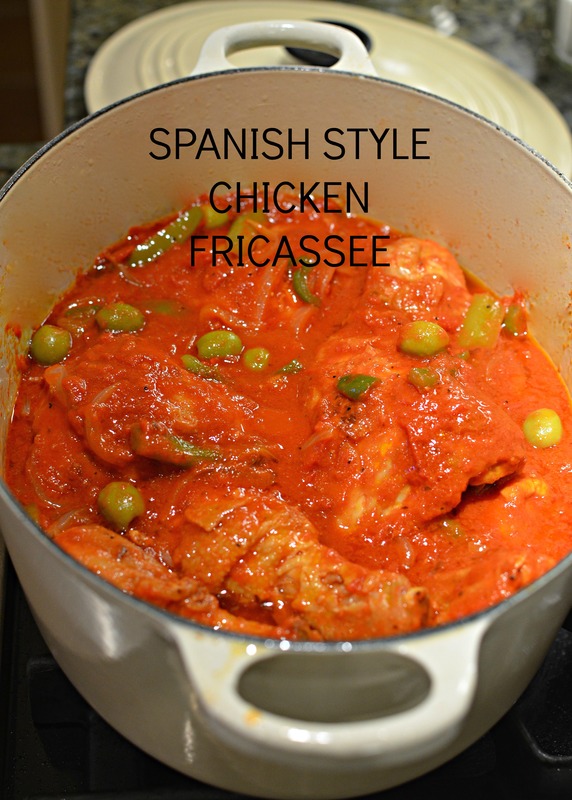 Today I thought I’d bring you one of my favorite recipes: Spanish Style Chicken Fricassee. Chicken Fricassee is a classic one-pot-wonder of a comfort food recipe, with many variations depending on the country of origin. For example, the French use cream and mushrooms in their Fricassee. My Puerto Rican stepmother adds potatoes and cilantro to her Fricassee and the Cubans prepare Fricasé de Pollo a la Cubana, to which they add orange juice and white wine. 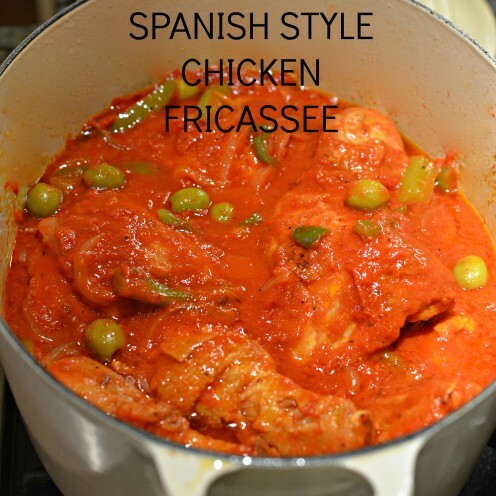 But I make mine Spanish Style and serve it over rice, similar to Arroz Con Pollo. 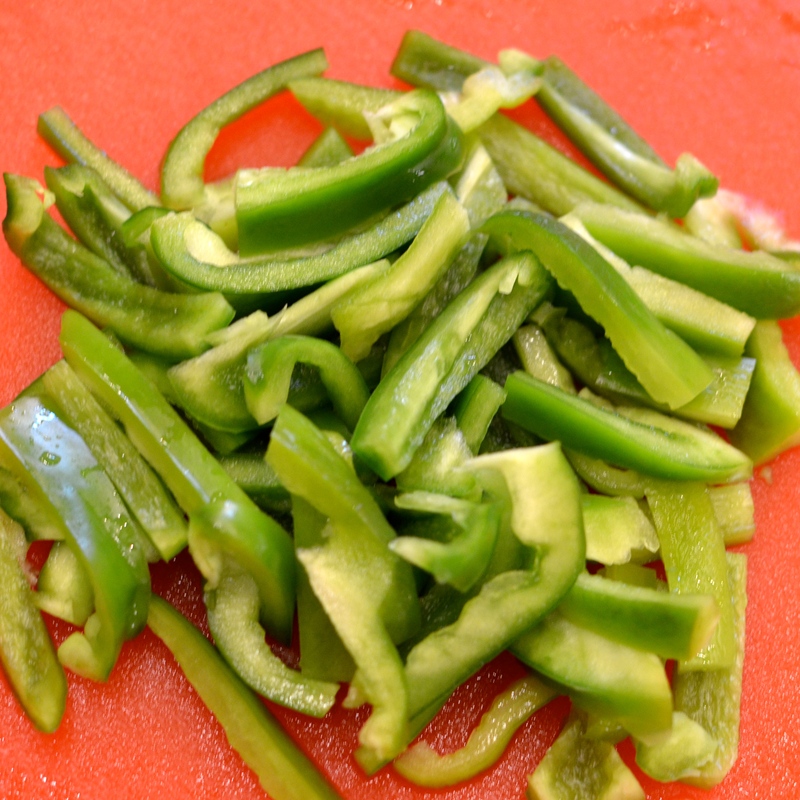 Here is how I prepare this delicious dish. 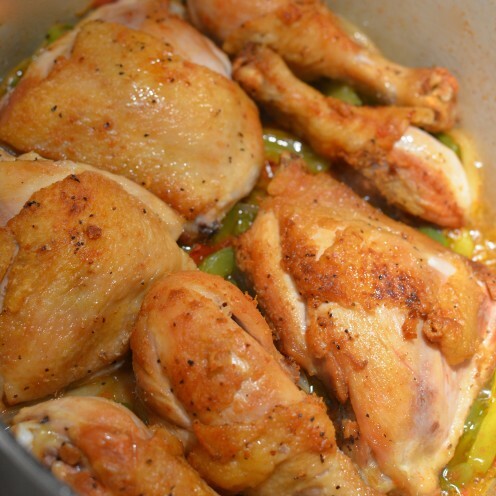 I prefer dark meat in my Chicken Fricassee and use 4 chicken thighs and 4 drumsticks. It would be perfectly acceptable to us a whole cut up chicken as well. 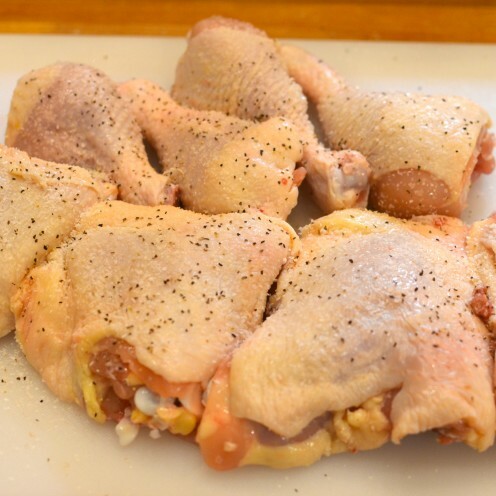 Sprinkle the chicken with a generous amount of kosher salt and freshly ground coarse black pepper. Add 1/3 cup of extra virgin olive oil to a large dutch oven and heat on the stove top on medium. Place the chicken in the hot oil. It should be sizzling hot. 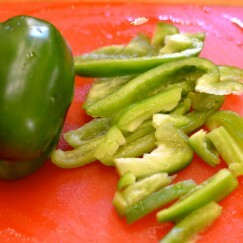 In this step you will be quickly searing the meat, not fully cooking it. Don’t over crowd the chicken. Fry it in batches if necessary, turning it occasionally until the chicken is golden brown on the outside but not cooked through on the inside. This takes about 10 minutes. 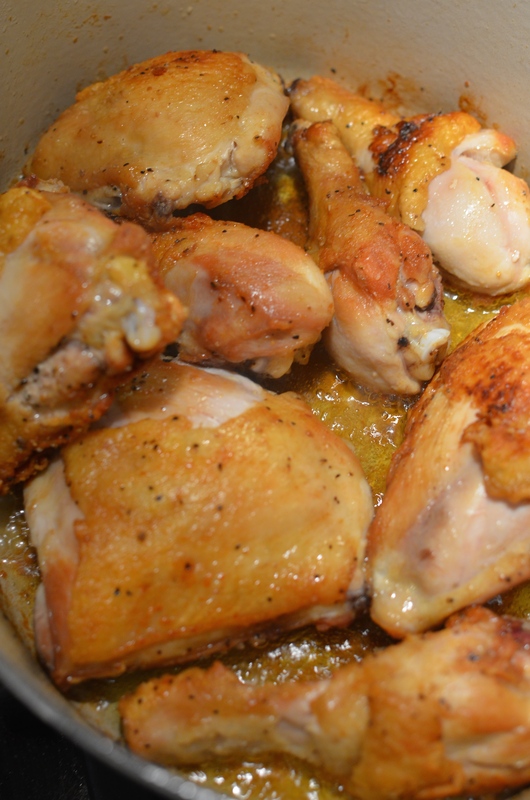 The golden caramelized skin will hold in the moisture of the chicken and add delicious flavor. 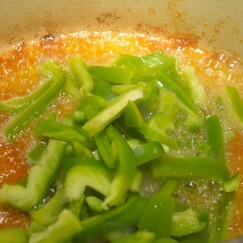 While the chicken is searing you may prepare the vegetables. Remove the seeds from 2 medium sized green bell peppers. 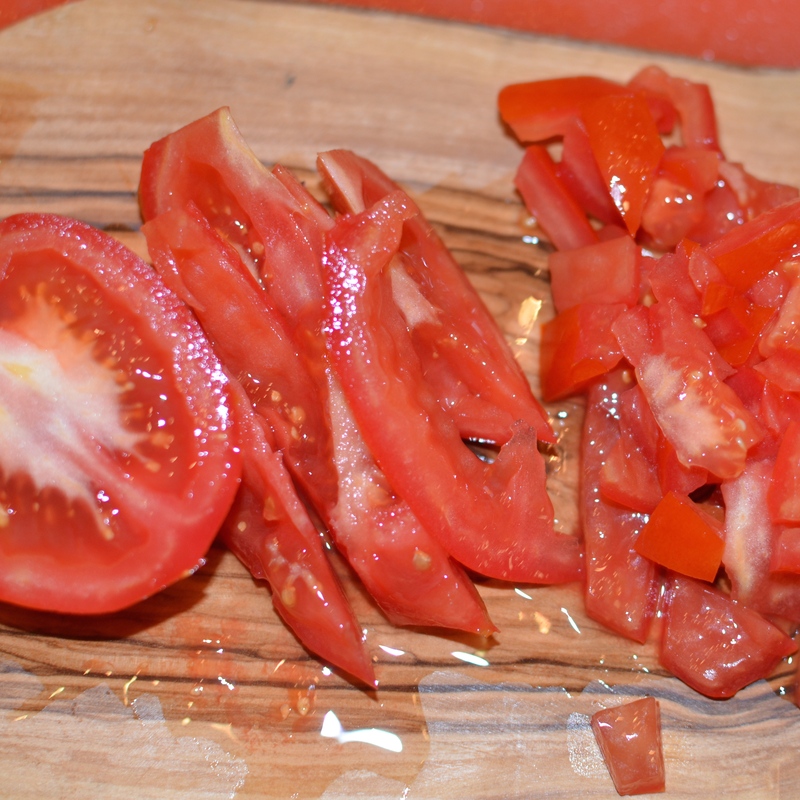 Slice them in long, narrow strips, then cut the strips in half. 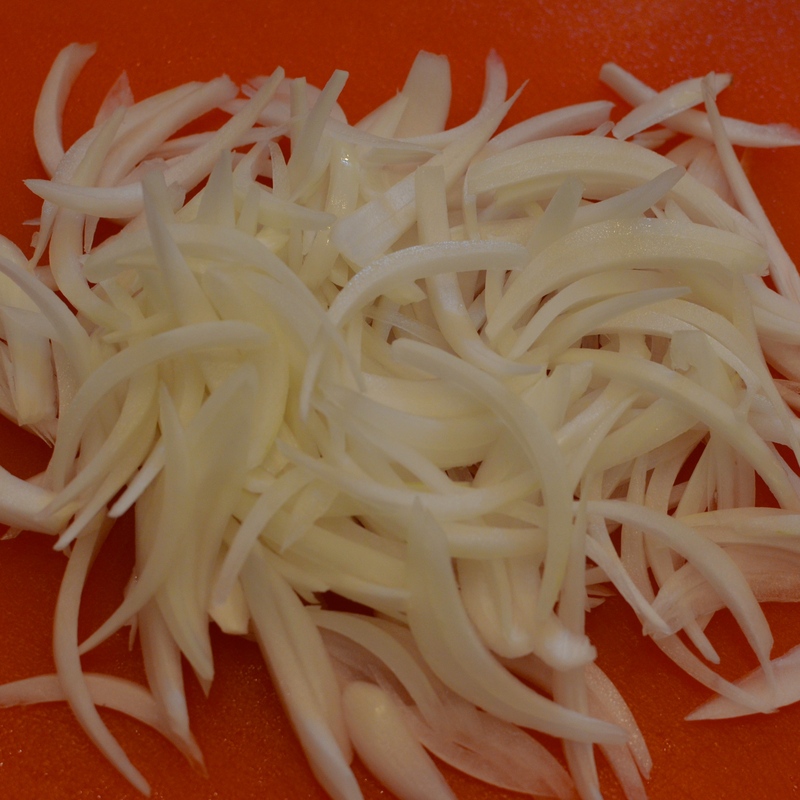 Slice 1 brown onion in long, narrow strips. 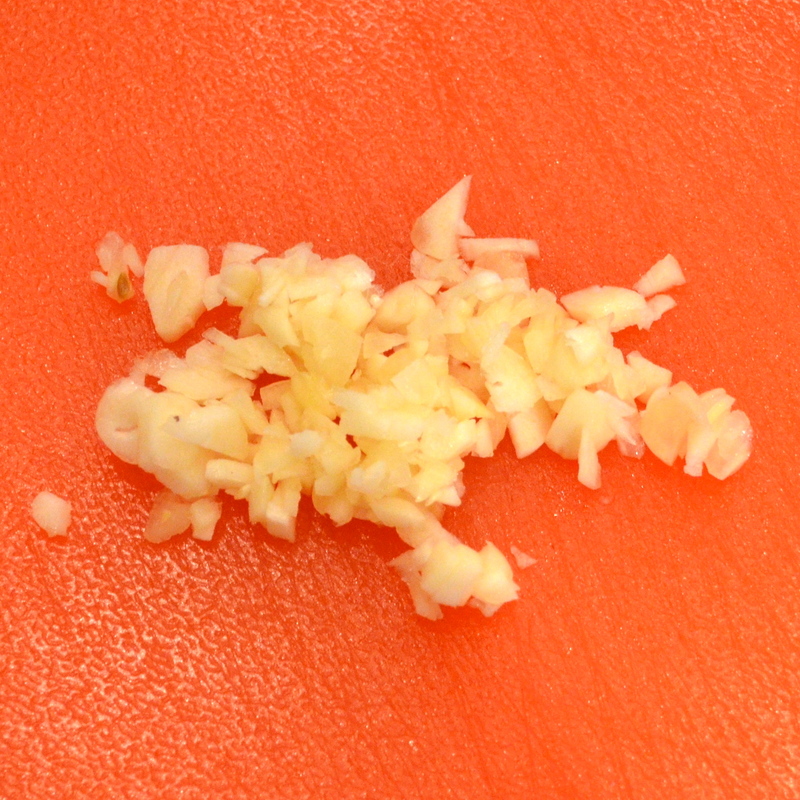 Mince 3 cloves of fresh garlic. Chop up 2 fresh tomatoes. By this time your chicken should be golden brown. Remove it from the pan and set it aside. Add the sliced bell peppers, onions, tomatoes and garlic to the dutch oven. 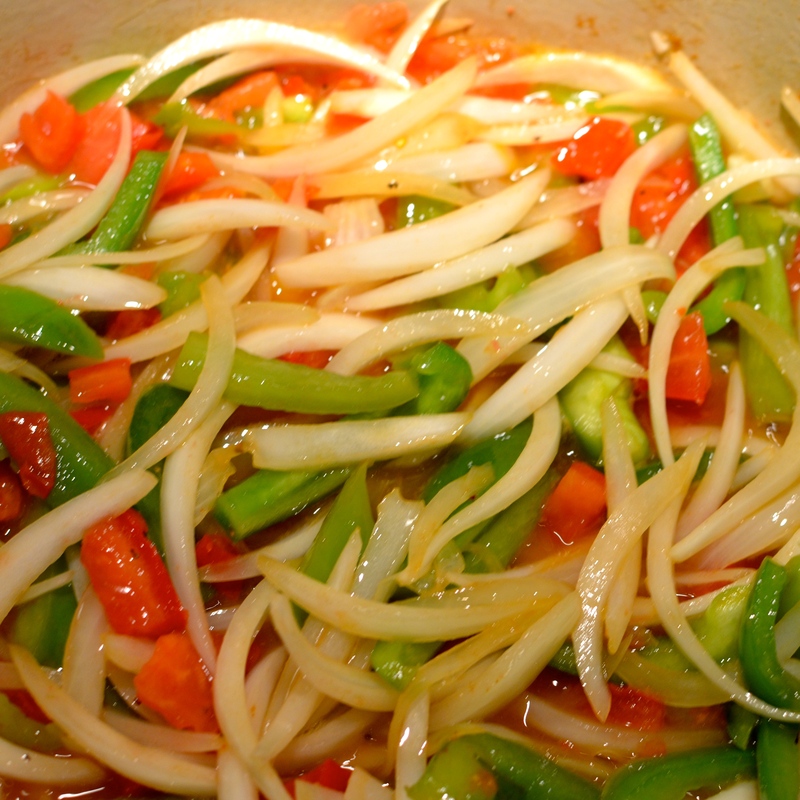 Saute the vegetables over medium heat, stirring occasionally, until they are tender. 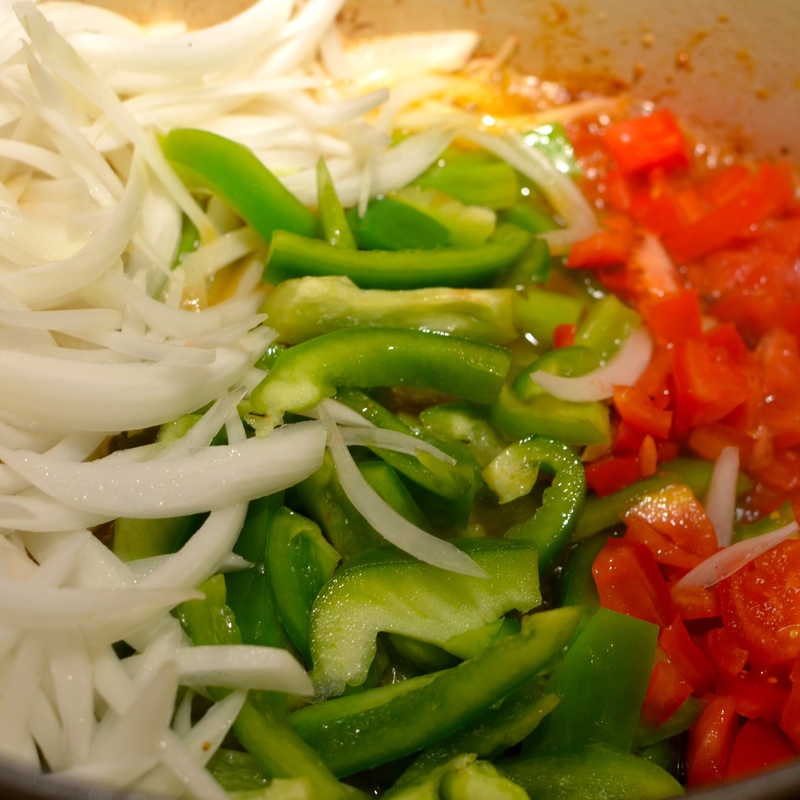 The veggies will soak up all that wonderful flavor from the chicken and olive oil and deglaze the deliciousness from the pan as well. 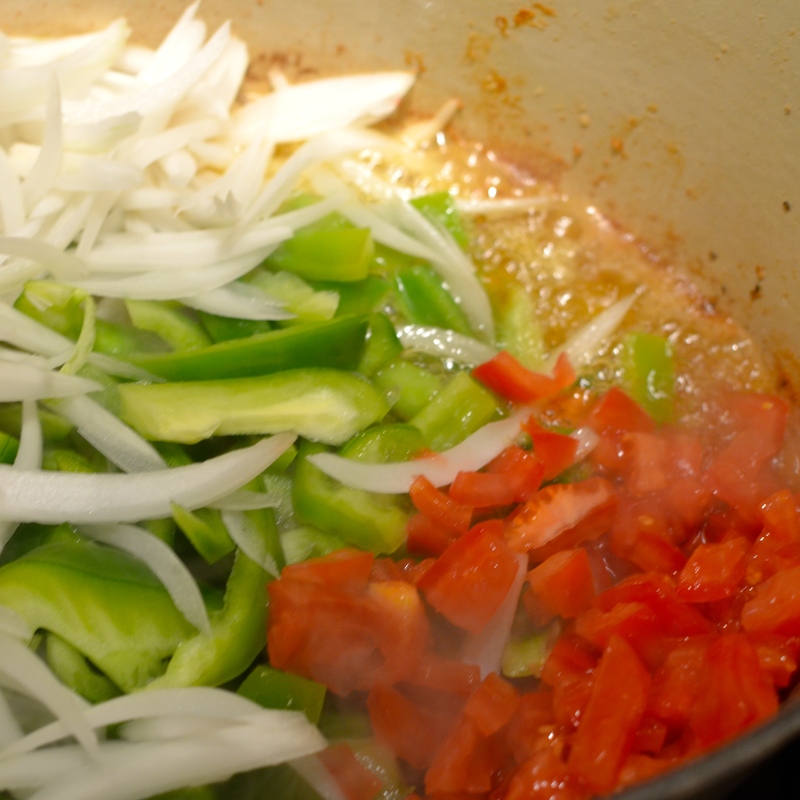 Place the chicken over the vegetables and remove the dutch oven from the heat. Next you will need 1-28oz. 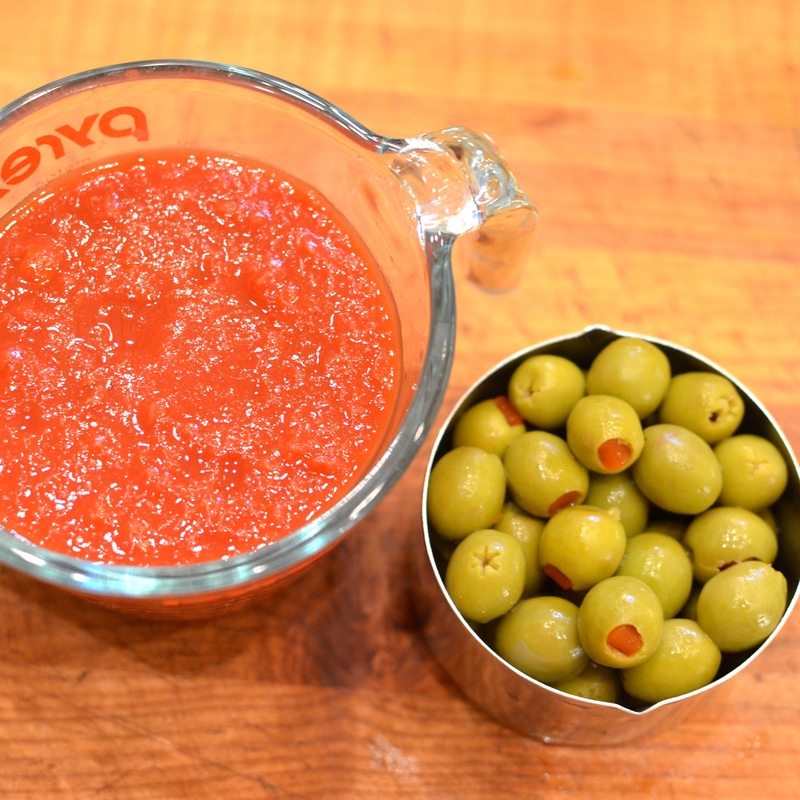 can of crushed tomatoes and 1 cup of pitted green olives with pimentos (drained). 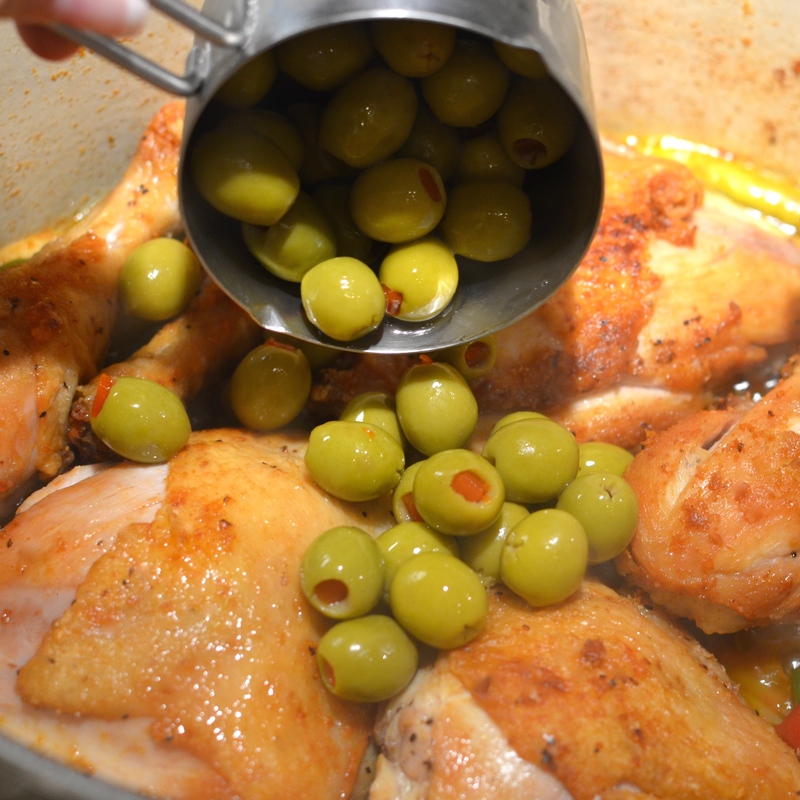 Add the olives to the chicken and vegetables. 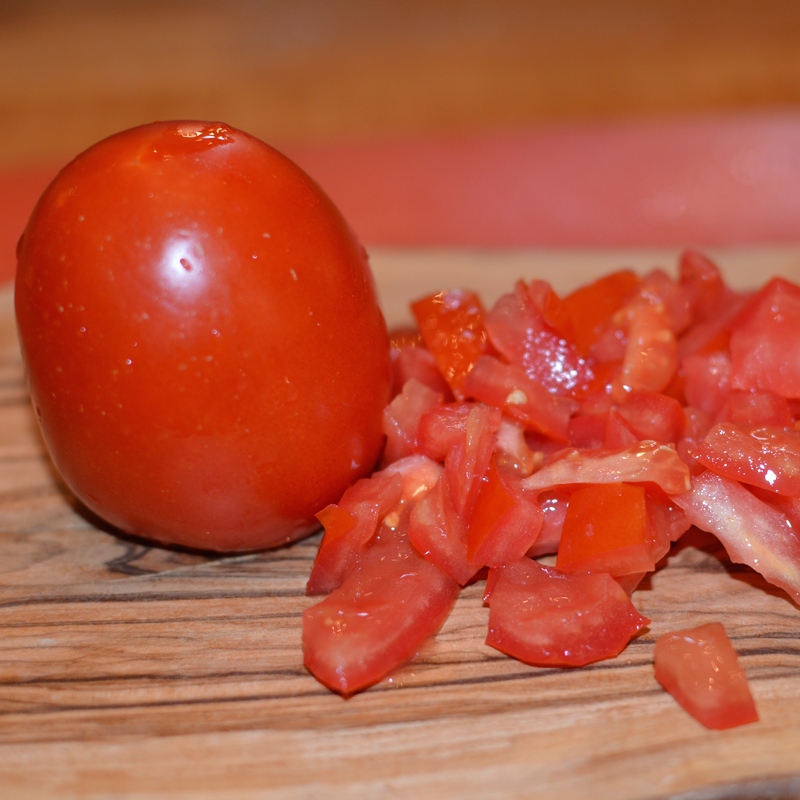 Pour on the crushed tomatoes. Next comes a very import ingredient that gives the Spanish Style Chicken Fricassee its special flavor: Sazón Azafran Seasoning by Goya. You should be able to find this in the international section of most supermarkets. If not it is available in Latin Supermarkets or on Amazon here. 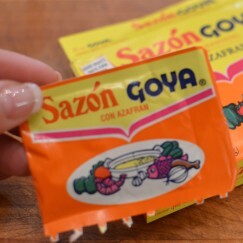 Add 2 packets of Sazón. 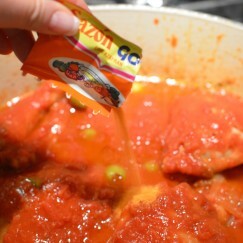 Using a large spoon, mix the ingredients to distribute the contents of the pot and mix in the Sazón. 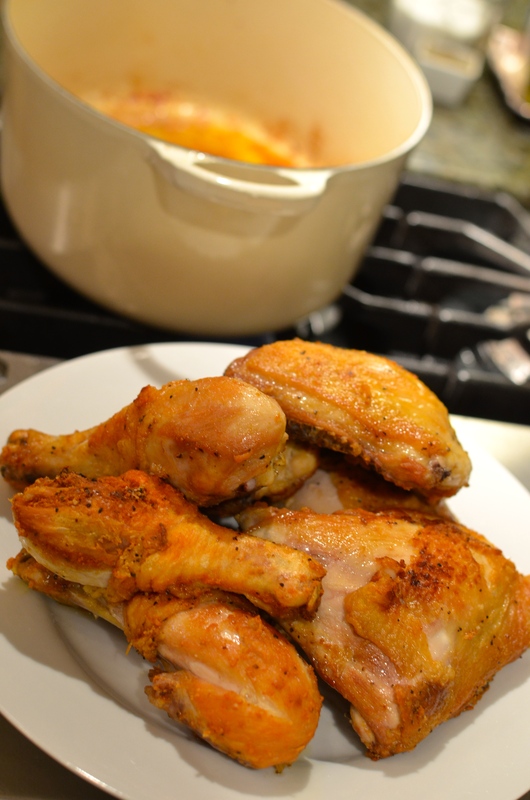 Cover the dutch oven and place it in the oven, preheated to 350°F. Cook for 1 hour. 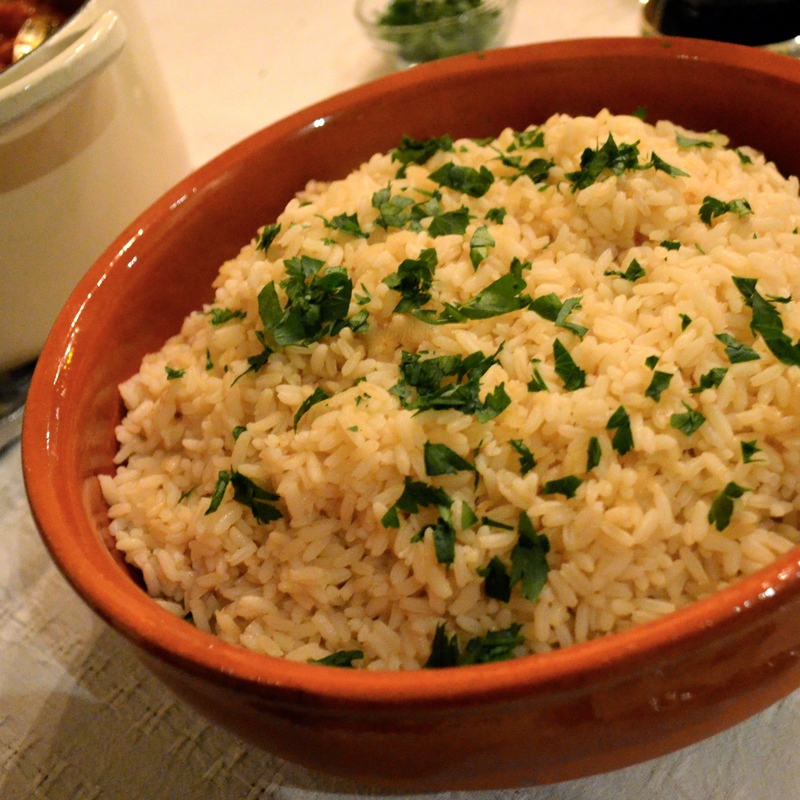 Serve over a bed of long grain rice. Garnish with fresh parsley. KITCHEN NOTE: Some purists would think me crazy to suggest using Uncle Ben’s Original Converted Long Grain Rice, however, I love it. Try as I might, I have always found it difficult to prepare rice and have it come out light and fluffy every time. I have overcome this challenge by using Uncle Ben’s for certain Spanish dishes where you do not want sticky rice. 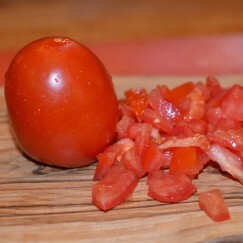 I use it in my Paella recipe for example, and so do many Spanish women I know. Unless you have mastered the art of making rice, I suggest Uncle Ben’s. 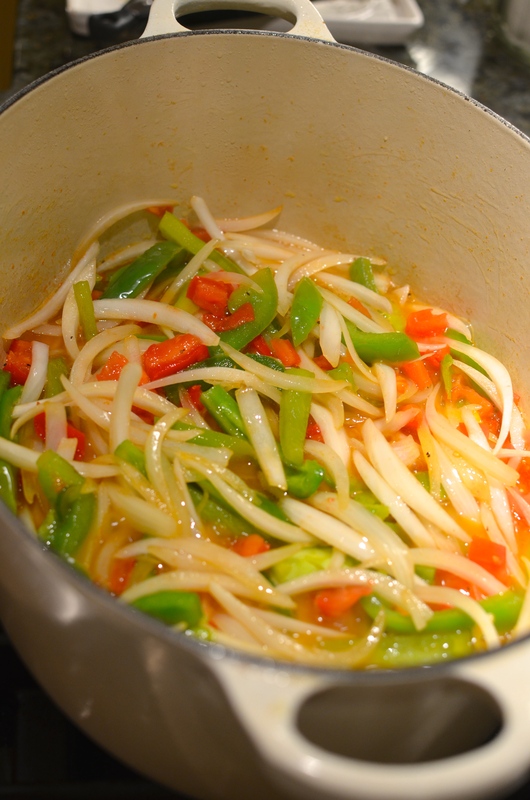 For added flavor I often prepare the rice using chicken broth. 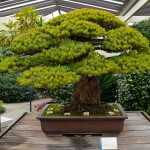 Try it and let me know what you think. 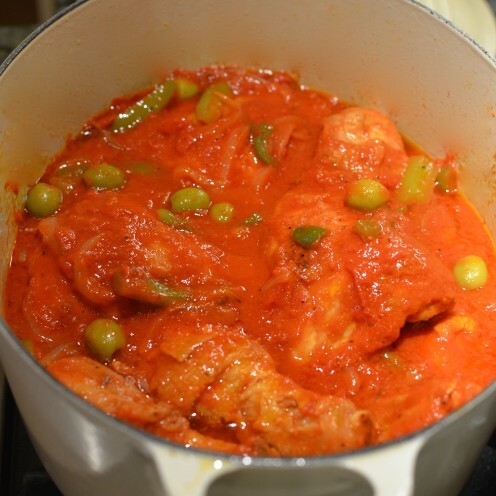 This delicious recipe is Spanish comfort food at its finest. The tender, fall-off-the bone chicken is made extra special by the addition of green olives and Sazón Goya, a saffron flavoring. Sprinkle the chicken with a generous amount of kosher salt and freshly ground coarse black pepper. 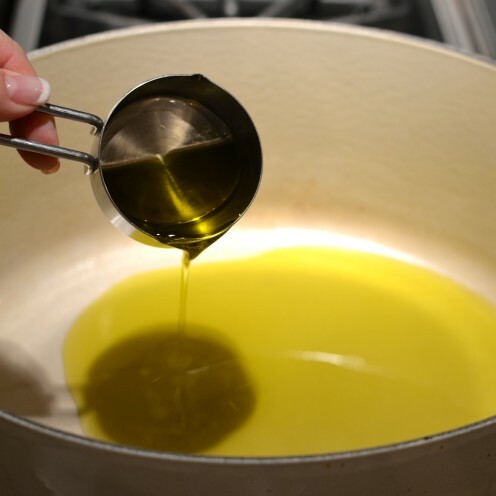 Add olive oil to a large dutch oven and heat on stovetop on medium. 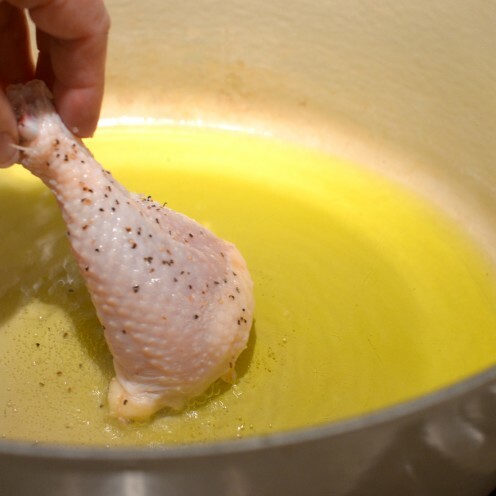 Place chicken in the hot oil. It should be sizzling hot. 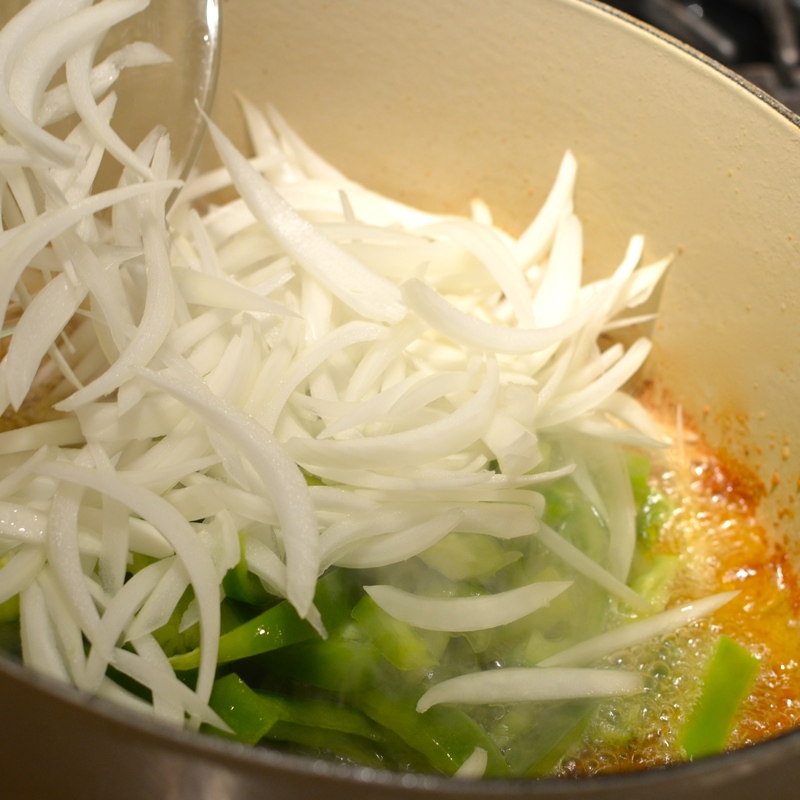 Quickly sear the meat until the chicken is golden brown on the outside but not cooked through on the inside. This takes about 10 minutes. Don't over crowd the chicken. 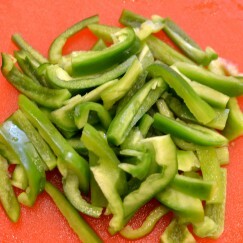 Fry it in batches if necessary, turning it occasionally. Add the bell peppers, onions, tomatoes and garlic to the dutch oven. 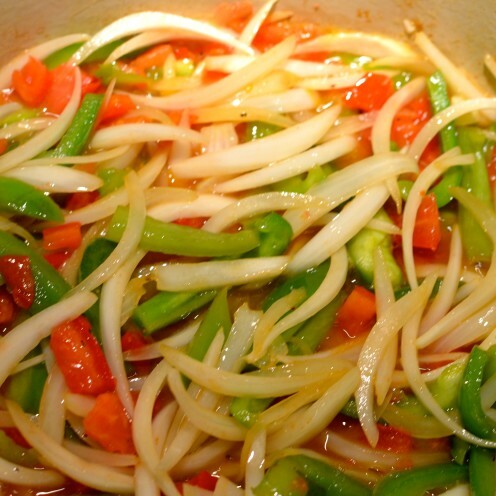 Saute vegetables over medium heat, stirring occasionally, until they are tender. 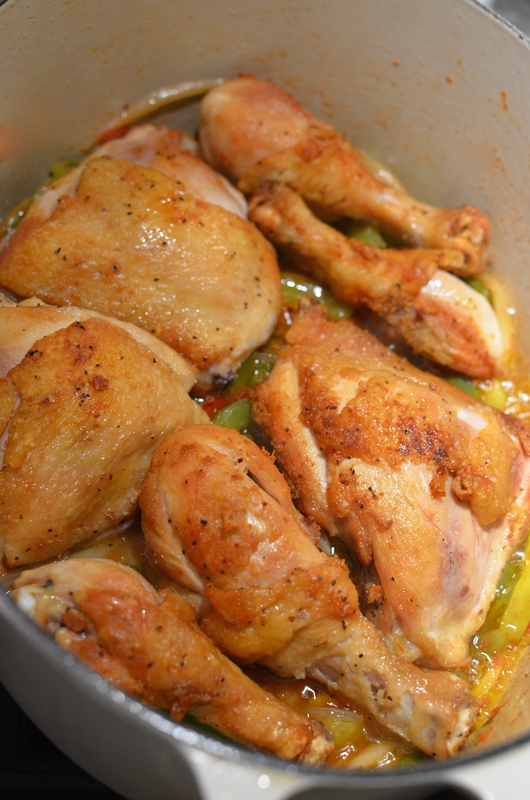 Remove the dutch oven from the heat and place chicken over the vegetables. 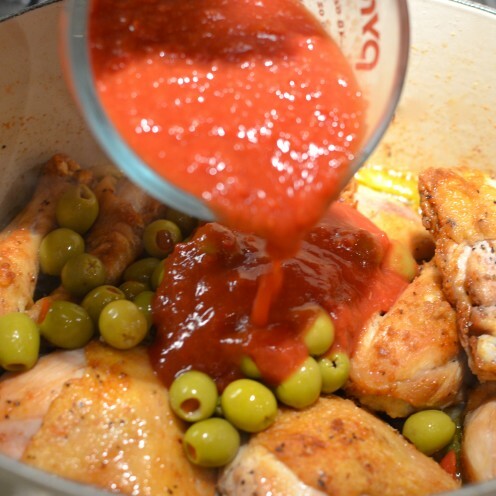 Add the olives and crushed tomatoes to the chicken and vegetables. Add 2 packets of Sazón.Using a large spoon, mix the ingredients to distribute the contents of the pot and mix in the Sazón. 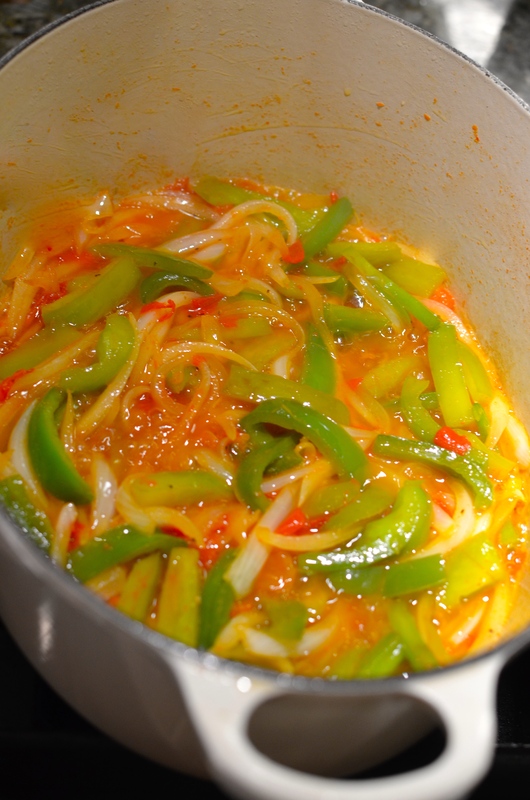 Cover dutch oven and place it in the oven, preheated to 350°F. Cook for 1 hour. Serve over a bed of long grain rice. I use Uncle Ben's Original Converted Long Grain Rice. 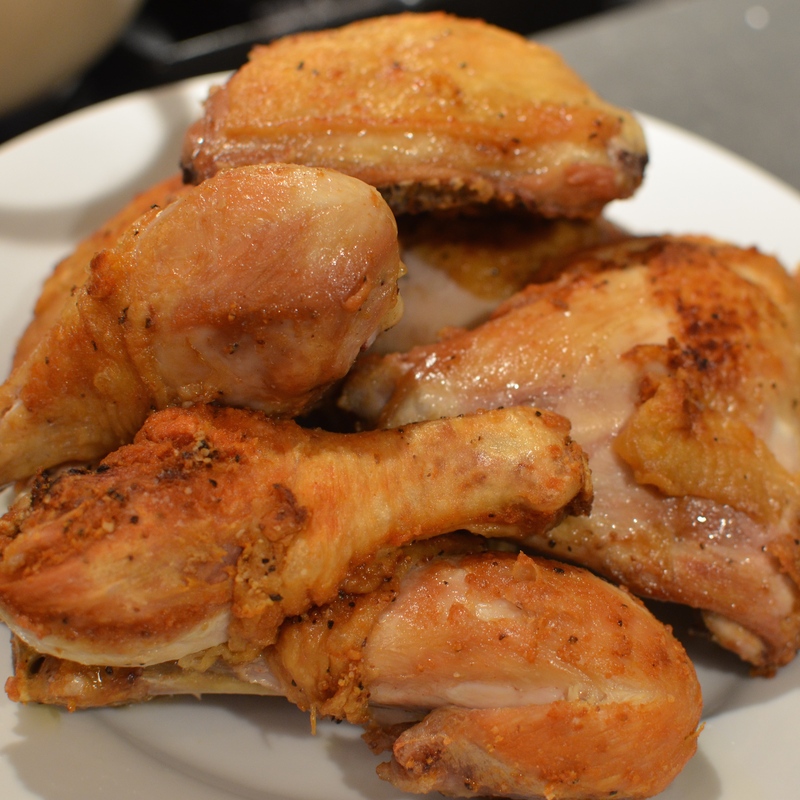 Feel free to substitute 1 whole cut up chicken in place of simply legs and thighs.